From my perspective underneath the mountain of paperwork, both complete and incomplete, it feels as though the adoption paper chase is actually eternal. Dante could have added a level to his Purgatory and titled it “Paperwork”. Paperwork Purgatory. It has a ring to it. Because I have this place, and you seven readers, to share the notable stories of our process, events tend to take on “oh, I HAVE to blog about this” personalities. One such story involved a piece of paperwork I filled out yesterday. Our agency is amazing. They are committed to preparing us for the realities of bringing our babies home. Some of the parenting education paperwork is more entertaining than educational. Yesterday I called the local elementary school to speak with a guidance counselor. Confession – I was homeschooled. The only guidance counselor I ever dealt with was my extremely capable mother. When I looked at this piece of paperwork that required the input of a guidance counselor I thought “How do you find one of those?” Turns out it wasn’t very hard. I called the school and asked the elderly woman with a Kentucky drawl if I could speak with a guidance counselor. The guidance counselor came on the line and I explained my needs. I suggested that I would be bringing home a child that would be elementary age, which may or may not be true depending on our referral situation still in the future. For the purposes of this conversation, my Chinese baby was elementary age. The guidance counselor was nice. She clearly deals with folks with not-so-much common sense on a regular basis because she spoke to me like I have a sub-hundred IQ. I do not love being treated like I am unintelligent. But one of the lessons I have learned at the ripe old age of thirty is sometimes staying quiet and letting someone treat you however they feel is proper is the quickest way to get information and get moving on to the next thing. So I listened and asked my questions. We discussed IEPs and ESLs and OHIs. Hope that one makes you giggle as much as I did. The Lord is gracious to provide for our every need – even comic relief. Blessings to you. It was nearly the end of day one in our weekend-long garage sale extravaganza. Technically there were still about 90 minutes left in the official sale-day, but it felt like a near-end. The slow of shoppers had stalled. The sun was beating down on the pavement, and anyone who dared venture onto said pavement. We sat on the clean floor of the garage and chatted. Well, I was actually laying down across the floor. There were no customers, I could do as I pleased. Mom had a Gambler-esque philosophy about the garage sale dollars. You know, knowing when to hold’em, fold’em, walk away, and run. Actually, she was specific about not counting her money while sitting at the table. Periodically she would vanish indoors to keep tabs on the income. It seemed like a good time to count since there were no new people to meet and sell to, so in the house she went. When she came out, it was with a half-laugh, half-groan. The laugh was because of the joy in realizing what God had done….the groan was because of the hilarity in realizing what we still had to do. We had $995. We were tired and hot and sweaty. We honestly wanted to go ahead and close up for the day. But seriously, if you have $995, you absolutely MUST stay open to sell $5 more. Sitting on the garage floor, no customers, no sounds except for the crickets…and not closing until we made five more dollars. A lady walked down the driveway. Turned around and walked right back up. Fail. Then a couple came down together. They were probably mid-fifties and they were very curious about our adoption. I hustled. I mean, I HUSTLED! I told all sorts of stories about adoption, special needs, our music careers, Dave’s role in the military. I HUSTLED. They did not find anything they needed to buy, so they decided to go through our book section, where everything cost $1, and pick up a few books. Guess how many they bought. Four. They bought four books for a grand total of $4. When they walked away we all just cracked up. $999. We needed one single more dollar. I’m fairly certain each of us considered running inside to our own wallets and “donating” that dollar. But that would have interrupted God. He had another hundred or so dollars for us to raise that day. It just took a tad more patience than we expected! We did not expect them to buy anything. I guess they just looked like garage sale lookers rather than garage sale buyers. Can you tell that by looking at someone? When my uncle died in 2004 he left behind a bit of a mess. There were so many belongings…so many memories. Most of his stuff has been sold or donated over the years. I have an old glass cabinet. There is a lovely figurine in the guest room at mom and dad’s house. But really, most of the stuff that remained when he died has a new home. Except for the massage table. My uncle was a massage therapist and he had purchased an extraordinary portable massage table. It was still in the basement, so it came out for the garage sale. 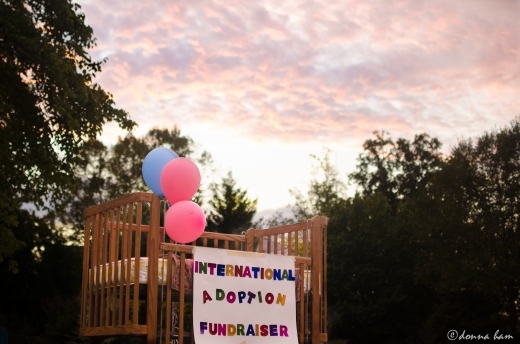 Since we were focused on raising funds for the adoption, there were a few big ticket items that we just were not interested in negotiating price. If they did not sell, we would put them back away. One lady offered us $100. I said no. I should have tried to negotiate, but the soft blue doe skin table just would not bear up to a negotiation. The boots had been sitting in the garage. Dad decided to donate a few incredible pieces of fire equipment to the fundraiser, the boots were included. Do you know how expensive boots are for firefighters? Oh my goodness! They cost nearly $400. Granted, they have to be specially made to protect in a fire. There are steel toe guards, Kevlar casing (isn’t that what they make bulletproof vest out of? fireproof as well…) and heavy soles. The boots were a size nine. What are the chances that a firefighter who wears size nine boots would show up at our fundraiser? The garage sale lookers turned out to be garage sale buyers. They were a mother-daughter pair and they were so sweet. The adoption really touched their hearts. Then they touched ours. The daughter, probably about my age, was in a serious car accident a while ago. Her neck and back were hurt so severely that she could not stand, sit, or even lay down comfortably. Her husband worried about her because she would moan from the pain – in her sleep. The only relief she ever felt was when she went to her massage therapist’s office. Something about laying face down on a table that still allowed her to breathe freely gave her respite from the pain. Mom and I had tears in our eyes. I think we almost just gave her the massage table. Who would not want to help? Mother and daughter stood looking at the table for a long while. Daughter’s husband was called a few times. He was at work. He is a firefighter. He wears size nine boots. He had never had a pair of boots quite as fancy as the ones Dad had for sale. Mom and I watched. There were a lot of other shoppers to attend to, but I do not think either of us took our eyes off of mother and daughter for long. They whispered. They talked. Then mother made a decision. She decided to buy the massage table to give relief and rest to her daughter. She decided to buy the boots to give protection to their firefighter’s feet. As we stood in the driveway with a few hundred dollar bills in our hands and watched mother and daughter drive away, Mom and I cried. Daddy’s career as a firefighter has ended, but he still found a way for it to help raise money for his grandbaby. My uncle would have loved the idea of me adopting my first baby. And now, as his gear went to serve in a new home, my uncle contributed to bringing my baby home. When you participate in a once-a-year neighborhood garage sale in a neighborhood the size of a mid-sized American city you are likely to meet many interesting people. He was out for a stroll on the eve of the big sale. He walked down the slight incline of the driveway to see what treasures were to be found. There was an air of pride about him as though he was the bearer of some great accomplishment, like a Nobel prize or the like. He carried himself in a kingly fashion. If the king was recovering from recent knee surgery. Okay, so he hobbled down the hill. But he definitely had a story to tell. You see, Mr. Hobbles won the Mr. Georgia pageant a few year back. Yes, it is true. At least as far as I have fact-checked. Which is not far as I do not actually know his name. But he bills himself as a former Mr. Georgia and that is quite enough for me. He had a sense of humor for days! He picked things up off our tables to ask what they were for. He laughed easily and loudly at his own jokes. When he saw the clothes rack though, he got truly excited. 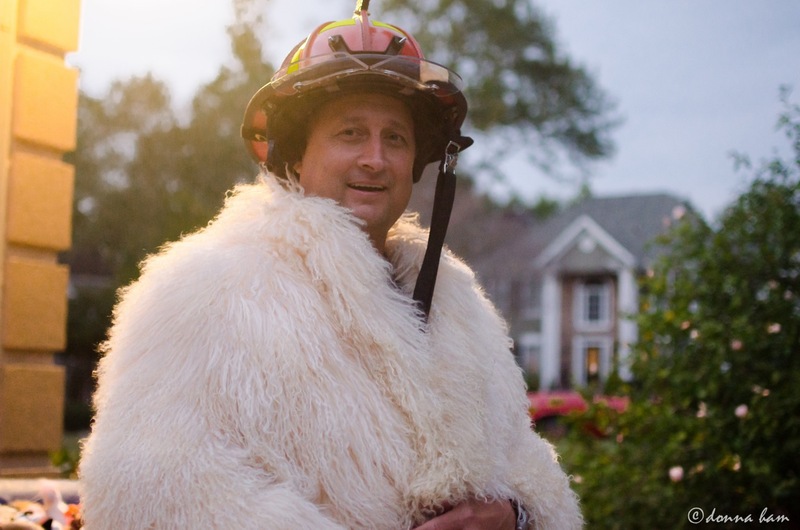 Next thing we knew, the Former Mr. Georgia was slipping into mom’s 1980’s Tibetan Lamb coat and accessorizing with dad’s custom-made leather fireman helmet. It was something to behold! Thankfully I am the daughter of a photographer. So there is proof. Thus goes the story of our adoption. This is a story with many chapters. Rather than starting at the beginning, I am going to jump in at a middle-ish point and eventually get back around to the beginning a good while before we ever get to the end. We have wonderfully supportive parents. We are so blessed! Our road to adoption began with Africa. The Lord closed some doors and told us to wait on Him. Then when He opened the possibility to adopt from China, we were THRILLED! Both times, as we have ventured into the adoption world, my mom has surprised us with her thoughtfulness and resourcefulness. Last weekend mom and dad hosted a huge garage sale fundraiser for us. I was blessed to have the opportunity to go down to Atlanta for it…and I am so glad I did! Oh, the stories I will tell! The first story is of God’s faithfulness though. That seems like a perfect place to start for this adventure that is so completely based in what the Lord has called us to do! How much money can you possibly raise at a garage sale? Seriously, how do you even begin to plan for it? As it turns out, we all had our guesses for the amount and we were all excited to see what God would do – and prepared to be exceedingly grateful for any amount. Dave and I are at a point in our process that is about to require dollars. We didn’t tell my family, but to take the next big step we needed $900. Of course I never expected to make that kind of money at the fundraiser. HE stepped in and SHOWED OFF! He said to our hearts “allow ME”. When it was all said and done, and believe me, there are many blog posts coming to tell you about what happened in the all said and done process, but when it was all said and done…. I deposited $1,932.23 into the adoption account. Besides bringing tears of joy and gratitude to my eyes, those dollars mean that we can not only finish the next step in our adoption – we can get to the point of being ready to mail our paperwork to China! Some friends and family have been confused about where in the world we will get the money to adopt our firstborn from China. I keep telling them – when God calls us to do something and we step out in obedience and faith, He provides for every need! Does this mean we don’t work for it? No. I have taken on extra jobs. Does this mean we don’t need to ask for help from our community? No. And we are blessed as they step up in support. This means we have front row seats to watch what GOD is going to do. This means we have the opportunity to grow our faith. This means we will get to TELL THE WORLD……our GOD is faithful to complete the work HE began! Tune in tomorrow for a story involving Tibetan Lamb, a high-dollar custom fireman helmet, and a former pageant king!